How can pro bono enhance a company’s HR strategy? Many companies share a common set of HR objectives, though each might have a different way of approaching or prioritizing them depending on a variety of factors. Today’s job seekers want to find purpose in their work and are looking for ways to align their personal values with their day-to-day work. Members of today’s workforce highly value professional training and development as a job benefit. A company’s employees are one of its most valuable assets and are critical to its ability to meet strategic goals, yet many companies struggle to retain talent and promote from within. Companies are increasingly focused on establishing an inclusive workforce that values a diversity of perspectives and backgrounds. How can companies take advantage of the opportunity? Although aligning pro bono with HR strategies is a relatively new venture, many pro bono practitioners have done so successfully. 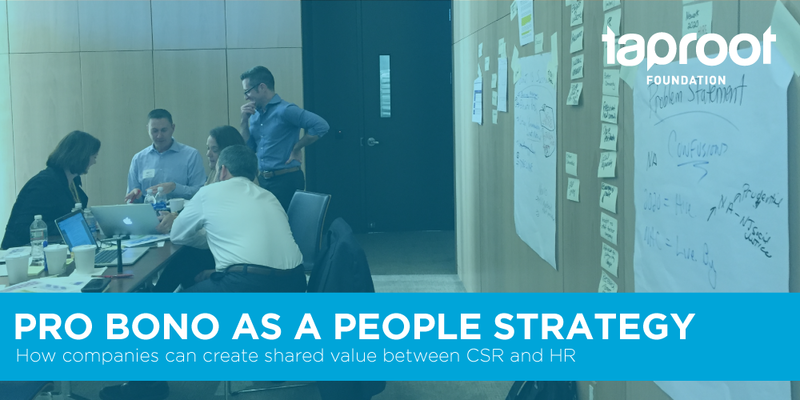 After interviewing several companies that are already working to create shared value, we culled a few of the key best practices that can help pro bono practitioners get in sync with their HR counterparts. See how Adobe aligned with HR to help employees hone critical leadership skills and develop expertise. Explore how Prudential Financial’s programs have flourished through finding Talent Management champions. Discover how GSK’s focused recruitment process built broad investment as a key talent development strategy. Learn how Deloitte’s stepup program integrates experiential learning into stretch opportunities. We know that corporate pro bono is a powerful and effective talent strategy. By employing the best practices outlined in this resource, you can demonstrate the shared value of that impact to compel broader corporate investment and ownership of pro bono. Seize this opportunity to embed pro bono within your company and drive the corporate sector towards greater social impact.